A reader's Concrete and Concreting question: Concrete steps? Surya W. from Jakarta, Indonesia had this Concrete steps question. I am very glad upon receiving your timely reply, thank you very much. Please visit Jakarta especially in commemoration jakarta 481 years . Jakarta was built on june 22, 1527. I want to build a concrete stair in the form of timber stair without the stringer. The steps are supported by a concrete block on the middle of the steps. So the steps appear floating . The stairs will be built in area of : wide - 1900 mm , length - 2300 mm and height - 3150 mm. 1. Make the steps separately and the concrete block is made as stringer but put in the middle , but when the steps put on the block how to secure them? 2. How to make the formwork so the steps appear floating ( due to no outside stringer). Then , how about the bar configuration ? Please tell me the easy solution to fill my dream. Ok, if you visit jakarta just inform me and I will be very glad to be your guide . Concrete steps - Pre cast concrete steps on double steel strings. Concrete steps - Detail at the base of the strings. 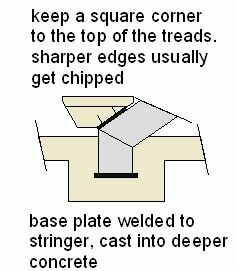 I think what you could do is to make pre-cast concrete step treads, that are supported on a steel stringer. This gives an effect that you may like. The use of steel makes it slightly more difficult, in that you have to get someone to do the welding etc. But using steel gives a lot more open look than say a concrete block wall. 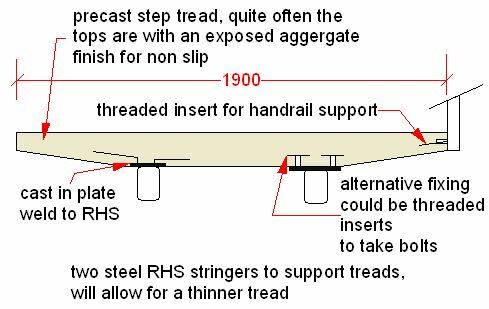 The treads can be made one at a time with fairly simple timber formwork, making provision to cast in the bolts or inserts for the fixing. You will have to get a structural engineer to detail the steel sizes and rebar etc. If you need more information, you will have to send me a sketch of what you would like to do.